Freefly Beyond VR headset is an improved version of the previous Freefly VR headset and in this review, we would be talking about the features and the improvements this headset has in comparison to the previous models. Freefly VR in itself was an amazing VR headset when it had released and it was way better than most of the VR headsets back in 2016. The Freefly Beyond VR has a few improvements making the headset better than the previous one but is it worth the money? 1. The lens is definitely better than the previous VR headset and the feel of the VR headset is premium and the built is sturdy and strong which is nice for the given price tag. 2. The headset is really easy and comfortable to wear. You can easily adjust the strap and adjust the weight of the VR headset around your face giving you a much better and comfortable experience. 3. The Freefly VR has a good FOV and it said to be around 120 degrees but I personally feel it is somewhere between 80-90 degrees which is pretty good. 4. The Lens is pretty big enabling you to get a better view of the VR world. 5. The VR headset has a lot more vents in comparison to the previous model, so the phone does not get heated up really quickly and you have a lot more play time on your hands. 6. You have a few more control buttons which ease up the use of the VR headset with iPhone users. This makes the Freefly Beyond a much better choice as a VR headset as it is compatible with both Android and iPhone users. The Crossfire capacitive touch triggers are the main highlight of this VR headset and they help in using this headset with various smartphones without any issues. 1. The VR headset is good but not great. There are no dials to change the IPD which is a bummer, especially for someone like me who wears corrective lenses. 2. Even though there are a couple of vents, that does not mean that you can cool down your phones for long periods of time, you have to use an ice pack if you want to use it for more than an hour straight. 3. The only major problem that I faced with this headset is focusing the lens, I found Merge VR had better controls that way. The lenses could be focused much better, giving you a better VR experience. The games are amazing on the Freefly VR headset and you can easily use the apps that are compatible with the Google Cardboard. The gameplay on this VR headset was a little better than the Merge VR while comparing the comfort and everything. The experience could be more immersive if they had lens adjuster which according to me was a big bummer as the headset failed to provide a great VR experience that I was looking for. 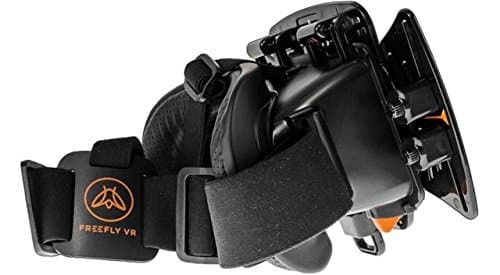 The improvements on this VR headset over the previous Freefly VR is amazing and if you are going to pick a headset from Freefly VR then it should be the Freefly Beyond VR. Similarly, Homido came out with a better-improved version which is the Homido V2 and it is definitely way better than the Freefly VR headset. I think I would rather choose the Merge VR or the Homido V2 if I was asked to choose between the two VR headsets. Do let us know what you think about the new improved version of the Freefly VR and if you think it would be better than Merge. Do you like the post? Then share it on social media!